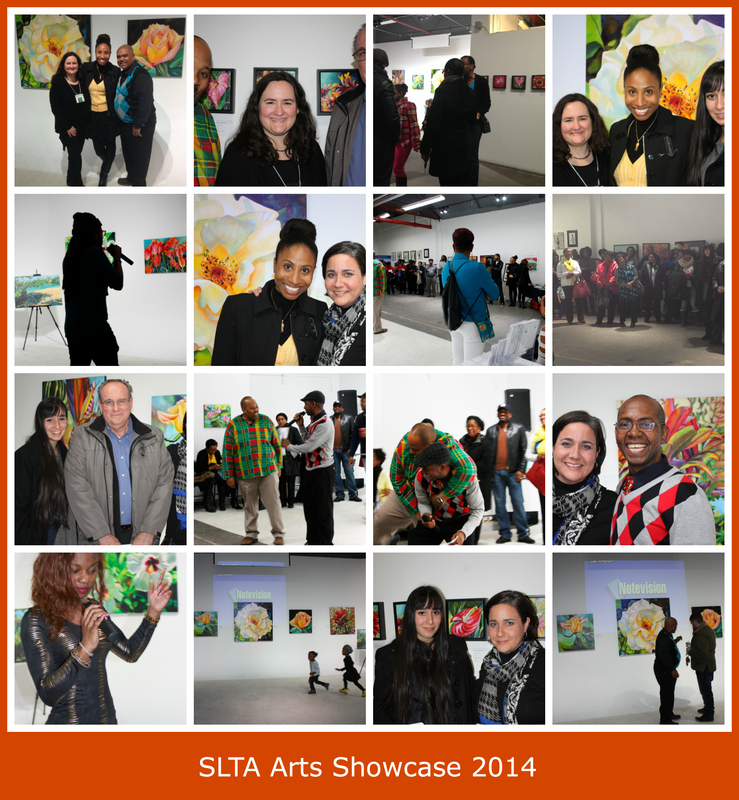 Feb 22nd was St. Lucia’s 35th Anniversary of Independence, and the president of the St. Lucia-Toronto Association – Ross Cadastre-Cadasse – invited me to exhibit my paintings in a Showcase of St. Lucian Arts. I suggested the Brockton Collective gallery as a location because I knew from talking to Bruno Sousa, that their facilities were outfitted to accommodate the diverse needs of those participating in the Showcase. Ross, Bruno, Adrian Rajaram (v.p.) and I met at the gallery in December for the initial walk-through, and I want to take a moment to thank each of them for all their hard work making this event a success. Gilson Lubin had to cancel, so Felix Fontinelle stepped up as M.C., and did a great job with his x-tempo delivery, even roasting the Association president, to the great amusement of all. Author Loverly Sheridan flew in from Florida to promote her three books, and even read from her children’s book on games St. Lucian children play. There were spoken word performances by Destiny and Chevy X Eugene. There was a short film “The Coming of Org” directed by Davina Lee, written by her father John R Lee. This film was at Cannes last year, and this is the first time it was shown in Canada. Priscillia Mullings exhibited her watercolours, and Cuthbert Volney showed his photography. Anna and her crew showed up with some delicious Caribbean food, and DJ Toxic did an awesome job with the music. Take a look at this QUICK clip near the end of the night, and you’ll see that the event got less and less formal as the arts & artists & audience mingled. 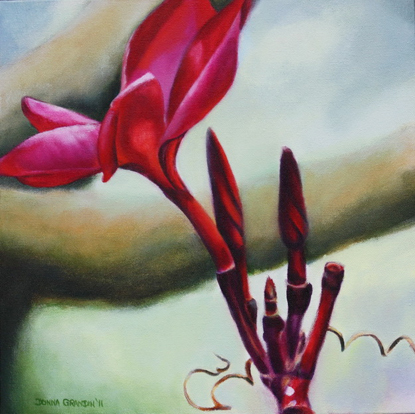 I exhibited a range of work, with tulips hanging next to hibiscuses (yes, that’s a word, I looked it up), but as the emphasis was on artists from the diaspora, it seemed appropriate. 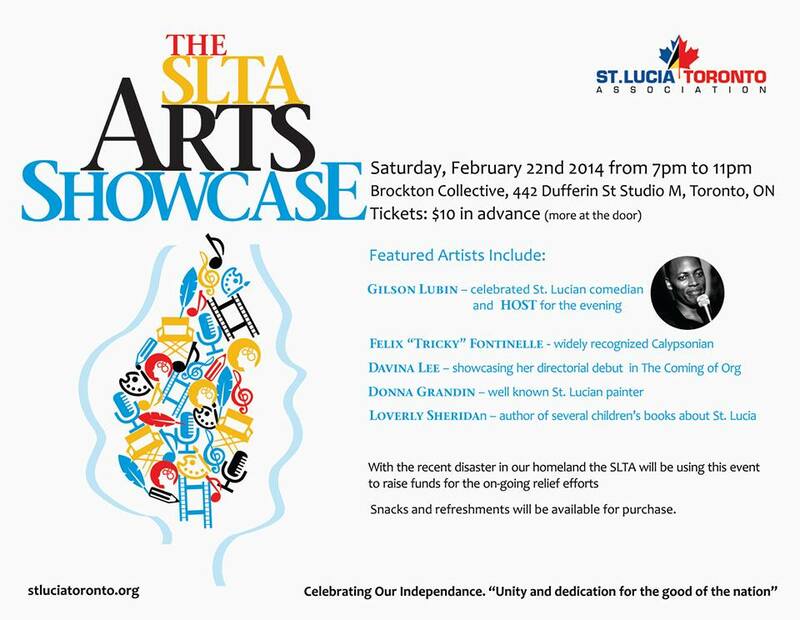 Anyway this Saturday, I will be displaying a smaller selection of my paintings at the SLTA Independence Gala (see flyer below). And I will be presenting a painting to one of the winners of the fundraising raffle – again, to raise funds for victims of the 2013 Christmas Eve flood in St. Lucia. As part of our Disaster Relief initiative, the SLTA will be donating all proceeds from its fundraising raffle to assist with the recovery effort in Saint Lucia. The raffle which was launched on December 1st will be drawn on March 1st. 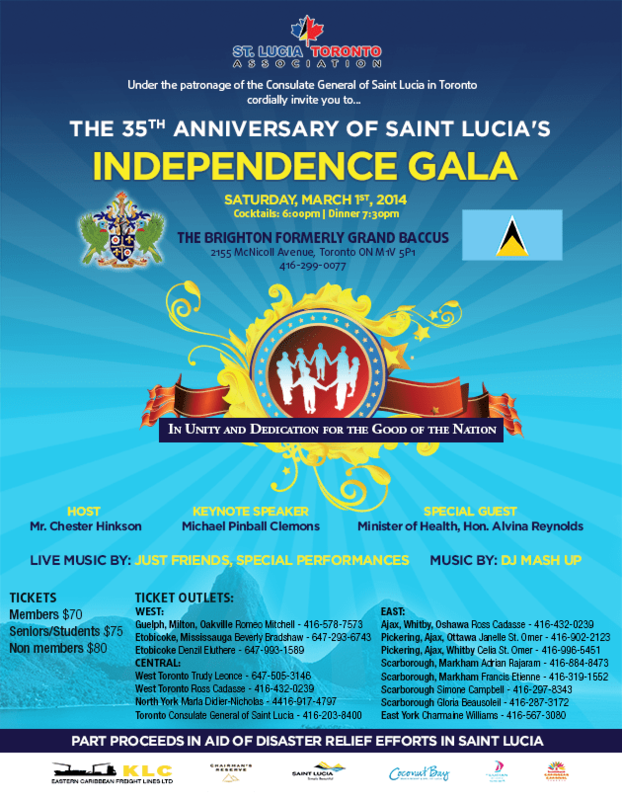 Tickets are available from executive members, the Consulate or by emailing stluciatoronto@gmail.com. And that’s all folks! Thanks for reading, I look forward to hearing from you. If my content is interesting to you, please subscribe to this blog, and to my newsletter. The following is a post that I’ve brought over from my original blog where I wrote about exhibitions, career highlights etc. in the 3rd person. 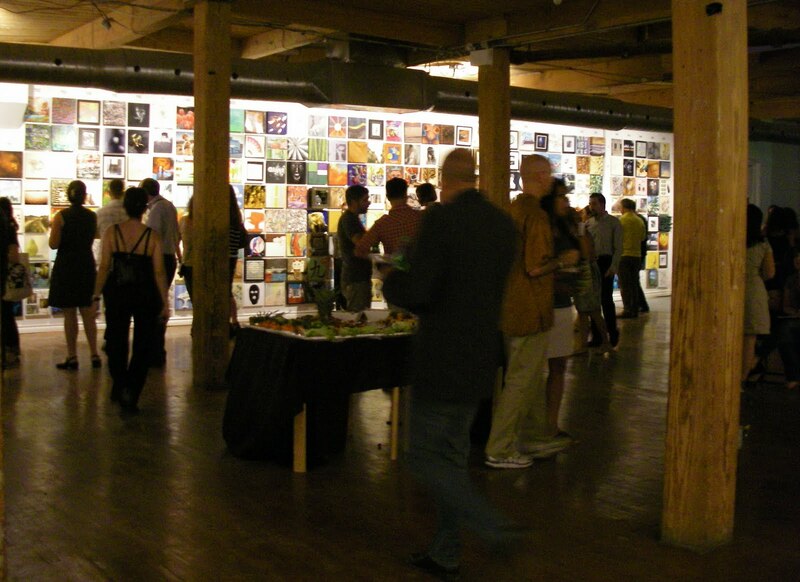 Gala Opening of the 9th Annual Square Foot Show, 5th Aug ’11, Twist Gallery. AWOL’s Square foot show is being held at the Twist Gallery in Toronto this year. Twist is located at 1100 Queen St. W. The exhibition and sale continues till Sun Aug 21st. Hours are Wed-Sat 12-7pm, Sun 12-5pm. Each artist (500 max) submitted up to 3 pieces, each had to be 12″x12″, but could be in any media, any subject. It’s wall-to-wall paintings, each time you return to a wall, you’ll see things you missed the last time you looked! With such a wide variety of styles etc, there’s sure to be something for everyone! 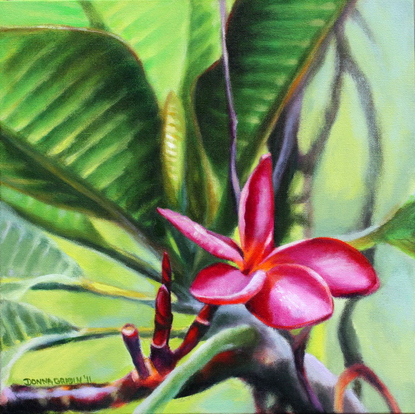 Donna has 2 new Frangipani paintings in this exhibition … let us know if you’ve spotted them! Juried in to Toronto Art Expo ’11! 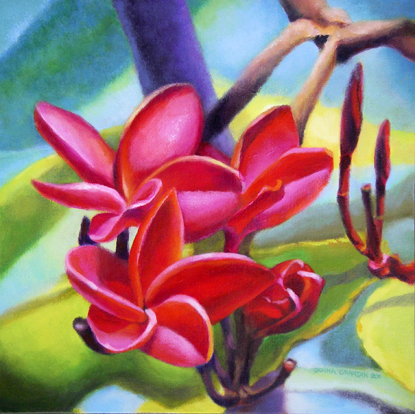 Donna has been accepted into the Toronto Art Expo, April 14-17 2011. This year, 15,000 art lovers from all over attended the annual event at the Metro Convention Center, downtown Toronto. To receive a postcard reminder featuring one of Donna’s new works a few weeks before the event, e-mail donna@bluerootsartstudio.com to sign up for her mailing list. Your contact information will not be shared.